Celebration time. Lorraine Carey (centre, striped top) is pictured celebrating the sale of the winning ticket with staff from her shop this afternoon last Friday. There was one Mayo winner of the Daily Million draw on Thursday last, March 9, which was sold in Carey's newsagents in Belmullet. The north Mayo family are no strangers to selling winning lotto tickets, with three family members selling winning National Lottery tickets in excess of €30 million in three separate shops in Mayo, Galway, and Dublin. 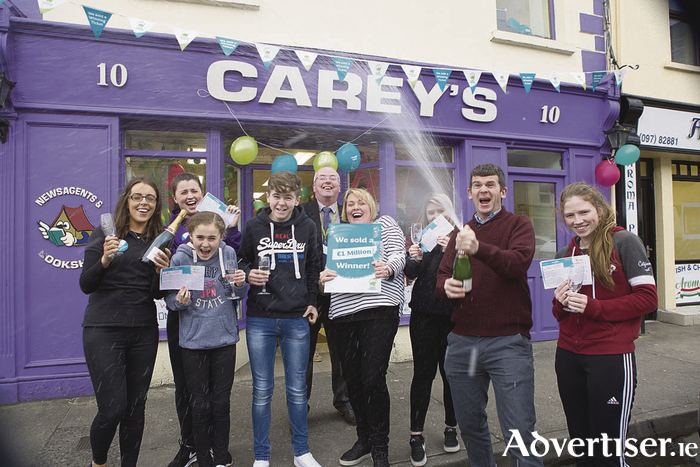 Carey's Newsagent in Belmullet has now sold an impressive five top prizes in National Lottery games. In 2016, it celebrated selling the winning ticket for a whopping €13.8 million lotto jackpot, the eighth highest lotto jackpot in the National Lottery’s 30 year history. It also sold a €500,000 EuroMillions Plus top prize in 2015. In 2012, the lucky Belmullet shop sold a Lotto Plus One top prize of €350,000 and another Lotto jackpot of €710,422 in 1991. Next time you are in Belmullet and you are feeling a bit lucky, then you should probably stop in Carey's.